Suncatchers are very popular this time of year. I presume because we start to see so much more of that beautiful sun. These suncatchers are easy, but make a great splash in any window. 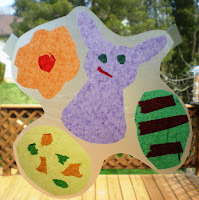 Over at preschool daze they made some great suncatchers too with a material I didn't even think about, check them out. Give your child a piece of contact paper. 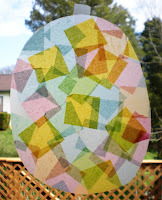 My first suncatcher was made with tissue paper squares. I cheated, I got some squares from school. 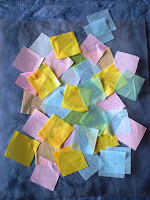 Let your child put the squares all over the piece of contact paper--they will stick pretty quickly. After they have made the design they desire, place a second piece of contact paper on top of the squares. Now, let them cut out a shape they like. Because it is Easter, I cut an egg. The second style is pretty much the same premise, but you know how I love those ripping activities. 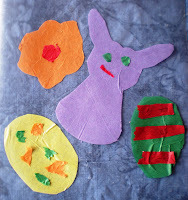 For this style, give the children the piece of contact paper and some various pieces of tissue paper. 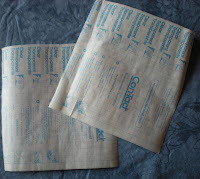 Then let them rip the tissue paper into pieces and put it on the contact paper. 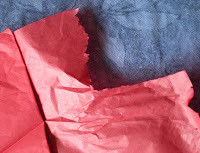 It is much easier to rip tissue than construction paper. 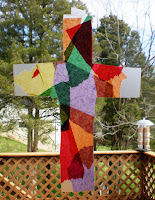 After the tissue paper is on, top it with the other piece and cut out a shape, for this one I cut a cross. 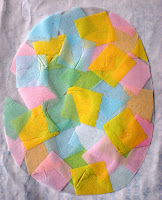 Finally, the last style is to cut shapes out of the tissue paper. I don't know about you, but I don't find tissue paper very easy to cut. It's much more fun to tear. 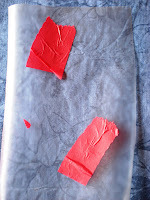 Anyway, take one piece of contact, let children cut shapes from the tissue paper and place them on the contact paper. When they are done, top with the second piece of contact. Put them in the window and enjoy all the beautiful colors. I hope you do not mind, but I had my boys make a sun catcher and linked to your blog were I got the idea.